History of casting Casting has a very long history. It is said to have originated around 4000 BC in the fertile land called Mesopotamia, which lies between the Euphrates and Tigris Rivers in the general area of modern-day Iraq. Casting was born in the world’s oldest civilizations, and can be considered one of the oldest manufacturing processes. Castings became a modern industrial product during the Industrial Revolution in mid-18th century England. With the development of a factory-system machine industry, casting became a cornerstone of modern “machine civilization” and provided many industrial products. 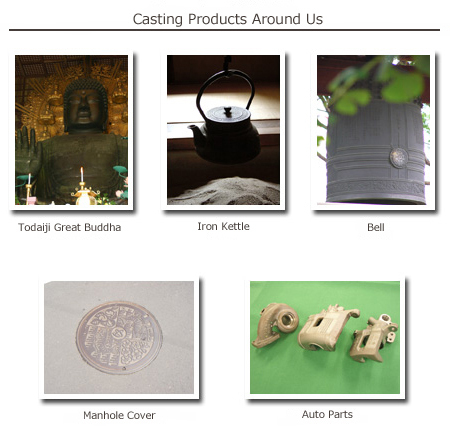 In Japan, casting was introduced several hundred years BC. In the 1st century AD, ceremonial bronze vessels called dotaku, bronze mirrors, swords, and other cast products were made in Japan. With the rise of Buddhism in the Nara Period (710-794 AD), production of cast images of the Buddha and bronze temple bells flourished, and by the mid-Heian Period (10th century), production of castings had spread to all parts of Japan. At the end of the Edo Period (mid-19th century), moves toward modernization accelerated rapidly in Japan. The Shogunate introduced technology from the Netherlands, and built a cupola, which is a type of furnace used to melt metal. This was the first step toward the modernization of casting. Casting has always played an important role in every age, and the technology developed over this long history has been handed down faithfully to the modern day. 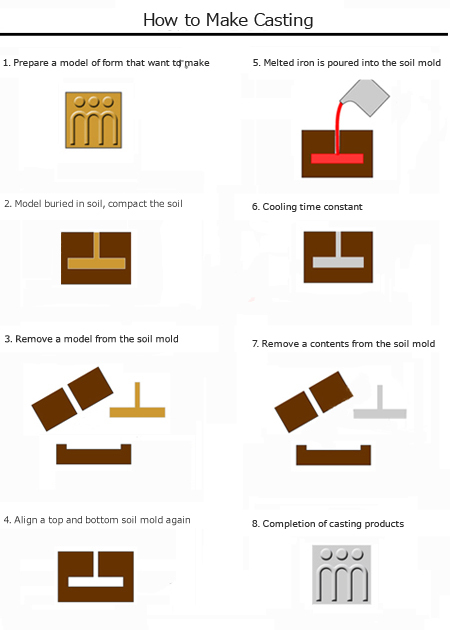 Characteristics of casting In the same way that water which is frozen in a plastic bottle keeps the shape of the bottle after the plastic is removed, metals also keep the shape of a mold when they are melted, poured into a mold, and then solidified by cooling. Because molten metal flows smoothly, just like water, complex shapes can be produced freely by this process. This is one great advantage of casting. Take advantage of this feature, casting products are actively used in a wide variety of fields, beginning with everyday products and also including parts for automobiles and industrial machinery, among others. 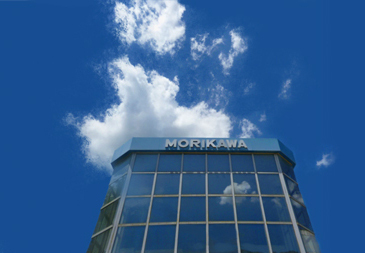 Copyright© 2019 MORIKAWA INDUSTRIES CORPORATION. All rights reserved.